Okay, okay… Han Solo likes that big, bad powerful bowcaster… But why is he so surprised and delighted by its power and handling apparently only now in this film? Hasn’t Chewbacca had that bowcaster for at least 30 years? And within those 30 years you are telling me Han Solo has never put his hands on that bowcaster before? Or witnessed its power in action? Really? The first time he’s touched it is during the events in this film? What is the in-universe explanation for this? I mean I know some couples are shockingly oblivious to the things their partners have, use, do and have done. But this seems a bit of a stretch coming from someone like Han Solo who seems to spend endless days/nights with his Wookiee sidekick getting into all kinds of wacky action/adventure predicaments. Han's brows knitted. He set the box down on the stool and unlatched its finely wrought metal clasp. Inside, snug in a bed of cushioning material was a beautifully carved bowcaster, its marked and blemished skeleton stock polished to a deep brown gleam. An artfully disguised magnetic accelerator, the weapon propelled explosive quarrels at extremely high speeds. This one was equipped with a sighting scope and a recocking mechanism few human hands would be capable of operating. "I recognize this," Han said, nodding. He compressed his lips to trap a moan fighting to escape him. "It's one of the first I ever saw him make." If this detail has carried over into the new continuity, then it's entirely possible that Han has never used this particular bowcaster. As @phantom42 pointed out in the comments on the question, Han Solo is most certainly a creature of habit. It is believable that before that instance in the film, he has always reached for his personal blaster when in danger rather than the weapon that his friend is actively using. After Han and Leia's son turned to the Dark Side, Han returned to his life as a smuggler. This shows us that Han will always choose the option that he is most familiar with, especially when he's in a new situation. This quote shows us that even when seeing a lightsaber for what we can assume to be the first time in his life, he is unimpressed and prefers to stick with what he knows — his trusty blaster. I don't have a screenshot yet, but on Eravana, right after Chewie got wounded by a gangster, Han shoots that gangster with Chewie's bowcaster. Same one, with large spheres at the end. He doesn't comment on it, being in the middle of firefight AND worried about Chewie. The sole purpose of Han's fascination with Chewbacca's weapon was to underscore the strength of Kylo Ren as he absorbs the blast from said weapon latter in the film. Arguably, Kylo Ren may have resisted the blast entirely if he wasn't so flooded with emotion from just having....done something to his father. There's a difference between knowing something to be powerful and experiencing the power yourself. Han may have known the bowcaster was a powerful weapon, but if he, as a creature of habit and healthy skepticism, had never bothered to actually fire the bowcaster himself, then he would likely be emphatically pleased after using it, feeling its kick (or whatever), and seeing the damage he just did with it. Han carries a handgun even when he has the time to prepare and carry a rifle such as the raid on Endor. He only uses a slightly larger weapon when he takes a storm troopers E-11 when on the death star. He apparently likes to use a small weapon that he is used to over a more appropriate weapon. He probably hadn't tried the bow-caster until he was forced to by the situation. In the book "Han Solo and the lost legacy" it becomes plain that the bowcaster was adjusted to the strength of a Wookiee. That means that Han was unable to draw the bow easily once it had been shot, just because he lacked the strength to do so. So, while he shot Chewie’s bowcaster (and loved it) on occasion it just was impractical for him to do so regularly. The man pulled at the front handle of the crossbow in order to draw the bow and to take the next bolt for a second shot from the magazine. But he did not make it; the mechanism of the weapon was set to the force and the arm length of a Wookiee. Chewbacca paused in his efforts just long enough to throw the crossbow with one hand to Han. Han caught it, turned in one smooth motion around, went to one knee and pressed the plunger to his cheek. He pulled the trigger, and the explosive shell hit the approaching machine at the junction between shoulder and arm. The metal limb fell off, and the robot trembled, but moved on. Han tried the draw the bow, however, discovered as the man in the city that his human strength was not enough. To address the upcoming question “Why didn’t he adjust a bowcaster to his strength?”: I always assumed that the superior strength of the Wookiee’s allowed the bowcaster to shoot the bolts with much more force than a bowcaster configured for a human, making it much more fun to shoot with it. This would make it "Legends", but IMO it is a pretty plausible explanation for Hans reaction. It is an another departure from Star Wars lore. Old Solo would never give up the Falcon or be fascinated with Luke's light saber. Yet the new Solo just loses it and is amazed by Chewbaca's crossbow. It was Imperium who was fascinated by technology like Death Star or At-AT, which were solutions on its own, not mere tools, yet treated everything as an expendable things, while Rebels used ships and fighter because they had to, but treated everything as a unique creation. Medical droid in V, father's lightsaber, even Alderaan. Solo never bothered about Milenium Falcon paint or look, but he was offended when Skywalker called it a junk. Because it was his junk. Part of his personality. Now Falcon is just old expendable garbage, he can buy a much better ship, while the crossbow is an amazing technology marvel he likes because it is effective. Not because it is a tresured possesion of Chewbaca like his Falcon is, but because it is effective. 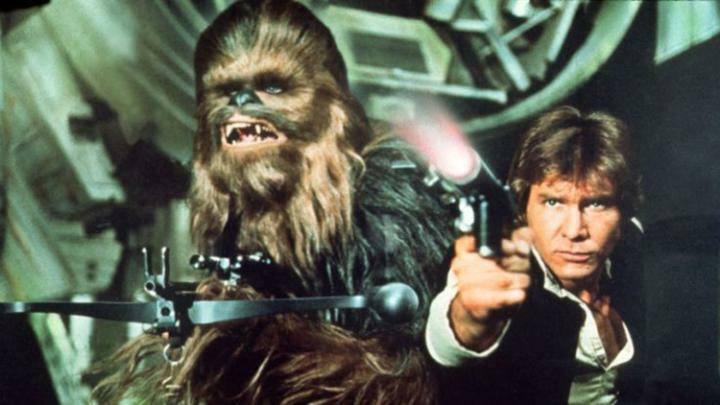 Why does Chewbacca’s bowcaster fire red projectiles? Is the bowcaster that Chewbacca uses in The Force Awakens the same one he used in the Original Trilogy? Why hadn't Han Solo paid Jabba? Was Jabba justified in kidnapping Han Solo? Why did Harrison Ford portray Han Solo as so likeable? Why didn't Han Solo become a Jedi? Did Han Solo know he was a General before Endor?